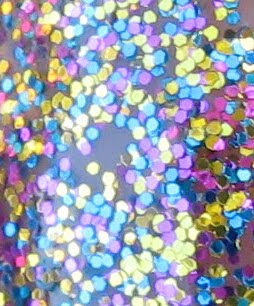 The only glitter I bought from the OPI Burlesque Collection was Sparkle-icious, and I have that to show you today. 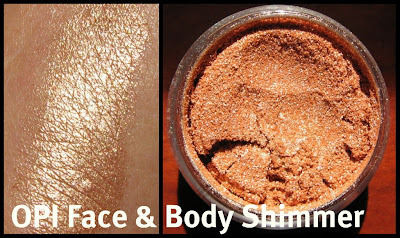 I also have a swatch of the Body Shimmer, which is one of the products in the promo sets. Above & Below: Two coats of Sparkle-icious is probably not quite enough for full coverage. One more coat would've eliminated any bald spots, or using a couple of coats over a base color would work well also. If you like glitter, you'll love this one! 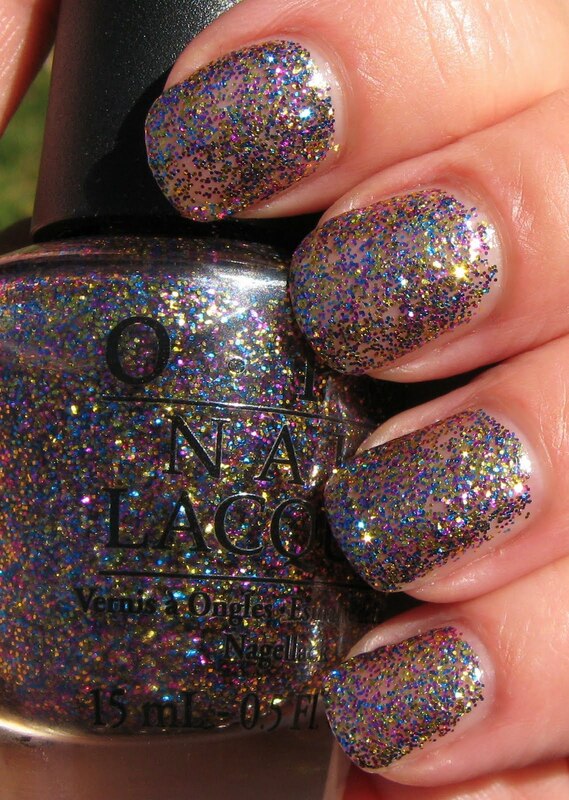 Billions of small hexagon shaped glitter adorn this polish in a clear base coat. The glitter colors are gold, fuchsia and turquoise. Photos shown were taken in filtered sun (above) and full shade (below). Below: If you have any of the old Maybelline Water polishes, applying a coat over a clear based glitter such as Sparkle-icious does a nice job of adding a muted background color without toning the glitter down too much. I used Emerald Water for this look. 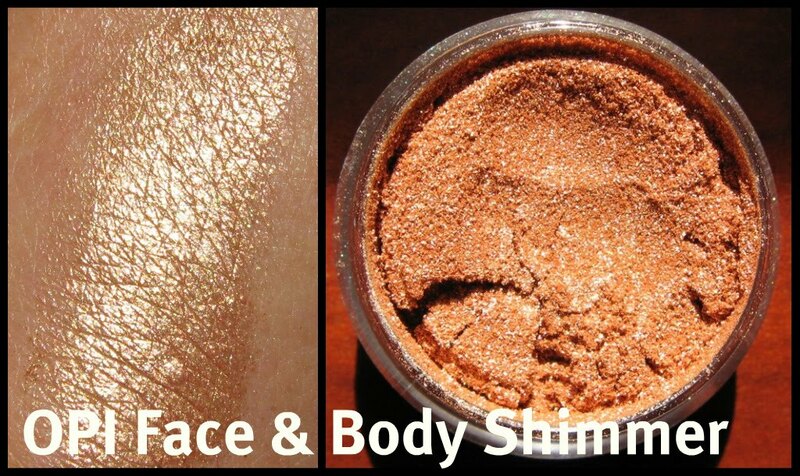 Below: The Body Shimmer comes in a good sized pot and is a very finely milled copper color that when applied, gives a foily golden look. This can be used as an eye shadow, or applied very lightly as a highlighter on the cheek and brow bones. It also works nicely as a highlighter on the shoulders and collarbone. I applied it lightly, then blended it in very well and it shows up as tiny little sparkles on the skin. I'm going to try using it in clear nail polish also. It's a shimmer, so you don't end up with any fall out as you would with glitter. How many of you got some or all of the glitters? 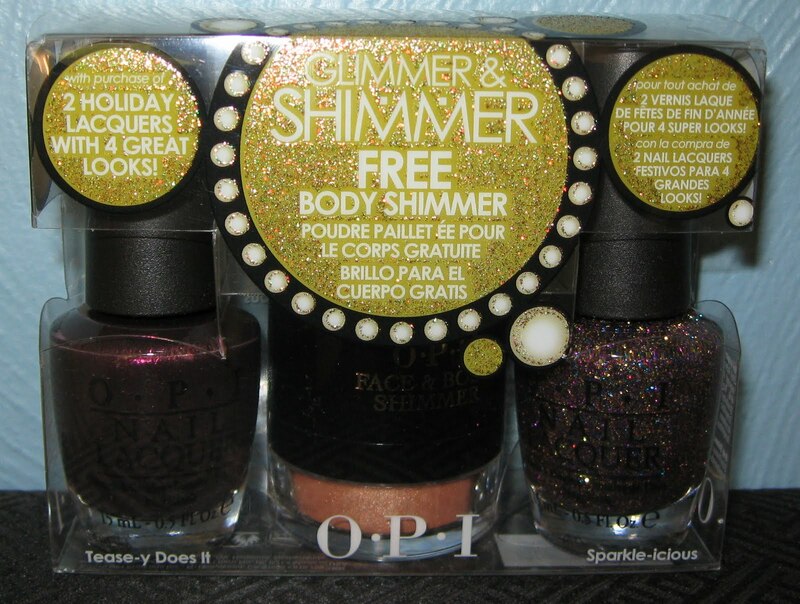 I thought about getting more, but I'm pretty happy with all of the shimmers and just one glitter. Unless one of you convinces me that I need more of the glitters! On another note, I'm not happy at all with what Blogger has done to our reading lists. I can only see a few at a time, so I'm afraid I'm going to miss something. Hopefully, that's just a temporary situation and they'll set it back to what we're used to. I thought I was the only one that noticed the reading list situation! It's so annoying. Anyway, lovely colour. I like what you did with the Maybelline Water polish! Love that glitter! Good idea to layer this one. I know I'll be buying this one. I love Emerald Water over Sparkle-icious, it gives it such depth! I'm sad I wasn't huge into nail polish when the waters were out. I think they'd be FABULOUS for frankening. I ended up getting the non-glittered Tease-y Does It and The Show Must Go On (after I first purchased 4 minis). I really like the glittery ones from this release but, I HATE removing highly glittered polish. I know there are methods of removing the glitter (including soaking cotton in remover, leaving it on top of each nail and then wrapping the nails in aluminum foil). However, I'd prefer to go without the pretty glitter polishes than standing in the bathroom (for what seems like an eternity) and inhaling dizzying polish remover chemicals. 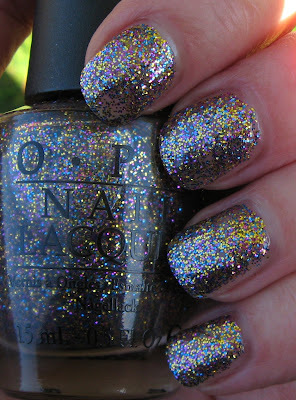 OMG I'm in love with that glitter & shimmer!